The lines covering this turtle are thought to resemble rivers or contour lines on a road map. This is how the animal acquired its name. Female turtles are medium-sized, growing up to 27 cm. in length (10 in. ), while the males are smaller, only growing to 13 cm. (5 in.). 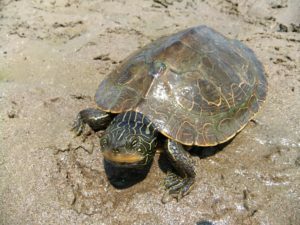 Olive or brown coloured carapace, covered with yellow or orange squiggly lines, yellow stripes cover the head and limbs. 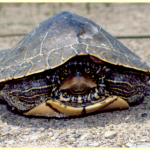 Head is large in relation to its body when compared with other turtles. Most have a small oval or triangular light spot behind the eye. Carapace has a toothed appearance along the rear scales and a peak or keel running along the back. Females will eat crayfish, clams and snails. Males eat smaller aquatic insects. Both will eat some carrion and plants. Hibernate from early November to early April. Highly aquatic and can swim long distances. A wary turtle that will dive in the water at the first sign of danger. Mating takes place in deeper waters, so little has been observed, however it probably occurs in spring and fall. In late June to early July, clutches of 10-12 oval eggs are laid in sunny, sandy areas. Males reach maturity between 3-5 years; females do not mature until 10 to 14 years. 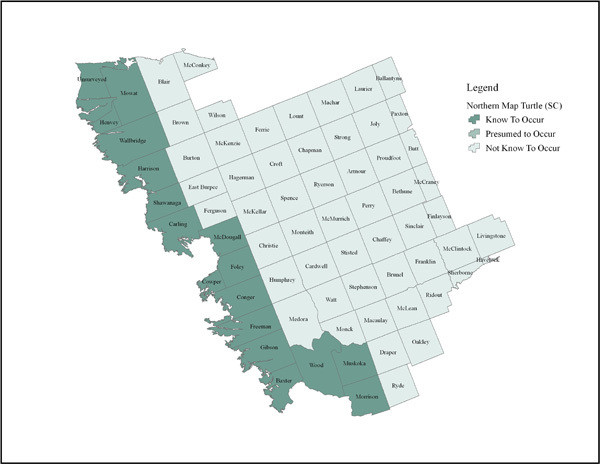 Shows preference for larger lakes, bays, rivers and open marshes, with mud, sand or gravel bottom. Habitat loss through shoreline development and recreational use. These turtles are sometimes struck by boats and boat wakes or the rise in water levels from a dam can damage nesting areas. Prey species such as clams may have high levels of heavy metals and other toxins. Operate watercraft with care. Please slow down near shorelines. This will benefit other species as well, from the Common Loon to the threatened Least Bittern.